Self care isn't selfish. How much time to you take for yourself each month? Life, work, family .... it can be busy and stressful. Self care can be the secret to a happy and balanced life. Learn how to scrapbook, create handmade cards or learn how to memory keep with Project Life pocketed pages. You pick what you create! Learn new paper crafting techniques and use a variety of Stampin' Up! products. Monthly projects are created by me, a two time Stampin' Up! Artisan Design Team Member. A fun night out filled with laughter and new friendships. Once in the cycle of the stamp club year you will earn the free Stampin' Rewards from the club group sales. This means that you will receive $20 to $70 free and you could earn an item at 50% off! 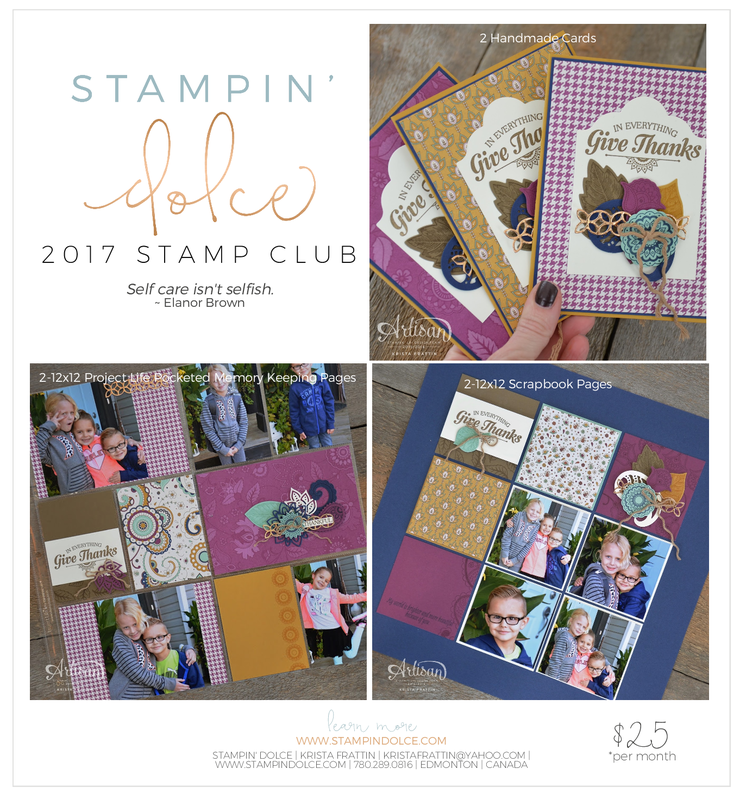 Stamp club projects are free with a $25 Stampin' Up! product purchase each month (plus shipping and tax). Stampin' Dolce stamp clubs are flexible to meet your busy lifestyle. I offer 4 stamp club evenings a month. You are welcome to do make up classes at any of these 4 stamp club nights. Experience is not necessary! I have first time paper crafters and novice stampers in my groups. Stampin' Dolce stamp clubs are for stampers 16 years and older. I have been running monthly stamp clubs for 10 years and we would love to have you join us. If you would like more information or if you have any questions please drop me an email: kristafrattin@yahoo.com.